What is your top of mind association, when you hear the word cocoa butter? It is very likely that it is connected with chocolate, hot drink, or cookies! Indeed, there are not very many people, who wouldn’t like any of the before mentioned treats. We all know how delicious ingredient is cocoa butter. But less known are cocoa butter skin benefits. They are very powerful and numerous, so it would be regrettable if we miss utilizing them. Today you will learn what are they, how to prepare cocoa butter recipes at home, and how to use cocoa body butter, to be happy and healthy. For the purpose, you will get seven cocoa butter recipes for skin, which you can easily blend and apply when needed. 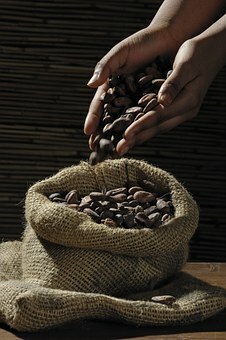 Cocoa butter, or theobroma oil, is derived from the beans of the cocoa plant. 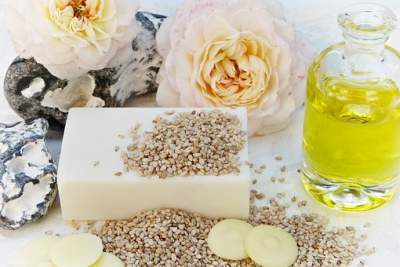 As you already know, it is not only edible vegetable oil but can be used for the preparation of cosmetic and personal care products, such as hair masks, shampoos, soaps, skin care creams, etc. It is solid at lower temperatures but melts around the human body temperature, which makes it easy to apply to skin. What is the composition of cocoa butter? Here comes the beautiful part – it is rich in monounsaturated oleic acid. It is omega-9 fatty acid, which reduces the bad (LDL) cholesterol, and increases the good (HDL) one. It also balances the blood pressure. It also contains stearic acid, which has cleansing properties, helping to remove sweat, dirt, and excess sebum from the hair and skin. Another compound of cocoa butter is palmitic acid, which can act as a cleansing agent, but it also plays a role as a natural emollient, moisturizing, softening, and soothing our skin. Cocoa butter has an antioxidant effect due to substances, called flavonoids. They have anti-aging properties, opposing free radicals in your body. Cocoa butter is rich in minerals, like iron, potassium, calcium, magnesium, copper, and zinc. Now you can understand why cocoa butter can become a successful homemade daily moisturizer for face and body. But we will talk about that a bit later. Before we move on, I would like to touch the topic about cocoa butter and cacao butter. Are you confused? Or maybe you think both terms mean the same thing? Well, it’s almost, but not entirely correct. 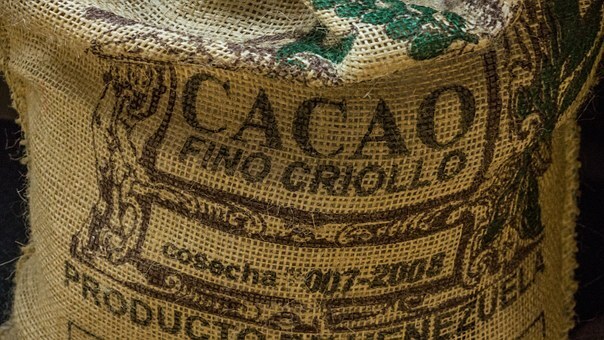 What is the difference between cocoa and cacao? The confusion might come, as both words represent the beans of Theobroma cacao tree. What you call cacao are the raw beans. They are very bitter, as further procedures include fermenting and drying. 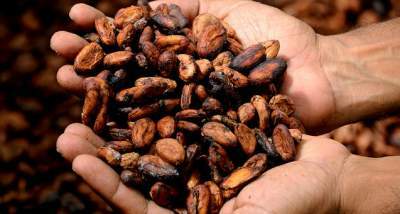 Cacao bean turns into cocoa one when it’s been further processed, like heating at a high temperature for example. To know where the bodies are buried – it is in the processing part! What matters to you is both types of butter are useful and powerful ingredients for your skin and hair care. Still, cacao’s health benefits are stronger, as it is less processed thus richer in natural compounds. How to recognize the high-quality cocoa/cacao butter? 3. It should stay solid at room temperature, as it melts on body temperature. The best way to store your body butter is in a cool and dry place. Thus it will not get rancid, and can keep its unusual properties for at least two years! They are so many, where to start from? You can use cocoa (or cacao) butter prevent your skin from wrinkles, stretch marks, acne, psoriasis, eczema, cellulite, skin wounds, UV sunlight. You can apply it to your skin, face, lips, hair, breast, neck, eyes’ area – practically there is no part of your body, where you cannot use it. Cocoa butter hydrates, nourishes and revitalizes the skin, improving its elasticity, cleansing it and healing it from some skin disorders. It makes you look young, due to its anti-aging effect on the skin cells. Knowing about all these goodies, here comes the moment to show you some homemade cocoa butter and essential oils solutions. You need 30 gr (1 oz) cocoa butter, 30 ml (1 fl oz) olive oil, 10 ml (0,3 fl oz) coconut oil. Melt the cocoa butter, and blend the ingredients, reaching an evenly distributed mixture. Add 25 ml (0,8 fl oz) water, and stir well. Let the mixture cool down, and massage your face. Leave it for 20 min, and wash with lukewarm water. You need 15 gr (0,5 oz) cocoa butter, 15 ml (0,5 fl oz) olive oil, 5 gr (0,17 oz) honey. Melt the butter and the honey, and mix all ingredients. Add 2 drops lavender oil. Massage the problem skin areas twice a day. To tighten your chest (especially if marks appear after pregnancy and breastfeeding), massage it with pure cocoa butter, to restore the skin elasticity. Cocoa butter, like shea butter and coconut oil, is a natural sunscreen, as it is thick enough, does not vaporize easily, and creates a thin protective film on the skin, with UV factor from 2 to 5. An excellent combination is to mix cocoa butter and sesame oil and to apply to the uncovered areas of your body. Warm up and mix equal quantity cocoa butter, coconut oil, and beeswax. Add 3 drops essential oil of your choice. Put the blend in glassware and store in the fridge, or cool place. Apply on the lips, when needed. You need 15 gr (0,5 oz) coconut oil, 10 gr (0,35 oz) beeswax, 100 ml (3,4 fl oz) jojoba oil. Warm up and blend all ingredients until you reach evenly distributed mixture. If you want to make it more liquid, you can add water of your choice. Stir well, and put the mixture in plastic, or glass container with a lid. Store in a cool place, or even better in the fridge, for longer life. Appy on your face. Leave it for 15 minutes, and wash with natural soap or shampoo. Due to its antiseptic and anti-inflammatory properties, cocoa butter could relieve your pain in case you have injuries, bruises, burns, eczema, and psoriasis. It will revitalize and regenerate your skin – apply cocoa butter on the affected skin area, to reduce the symptoms. Now, when you know the power of cocoa butter in helping your skin look young, and be in good condition, you probably have no doubt why experts include it in professional cosmetic and toiletry formulas, to create numerous types of products – soaps, shampoos, lotions, creams, hair and skin masks, ointments, sunscreens, etc. Even better using them, if these products are natural. Combined with other vegetable and essential oils, plant extracts, beeswax, and vitamins, cocoa (or even better – cacao) butter brings its enormous value and you certainly don’t want to miss it for your skin protection and maintenance. Don’t hesitate, and take action! Either using cocoa butter as a homemade solution, or finding it as an ingredient in an excellent skin care product, learn what works best for you, and apply it! Your skin deserves you pamper it! I would love to hear from you! Do you (plan to) use cocoa butter? Drop me a line below, and I will answer you!